Pastis is commonly yellow because of caramel, added as colourant. Some, however, are without any colourant; some yet are blue (added colourant or curaçao as la salamandre) or pinkish from the natural essence of red fruit extracts. The major components of pastis are green anise, star anise and/or fennel. These ingredients contain a lot of anethole: the anise essence. Liquorice is also part of the recipe and a mix of other components specific to each brand. Herbs may include those from Provençal such as thyme, melissa, savory, rosemary, verbena and sage but also some lemon and kola nuts…some varieties of pastis have up to 70 components! You will find a lot of different brands; their individual tastes depend on the components and the amounts of each. 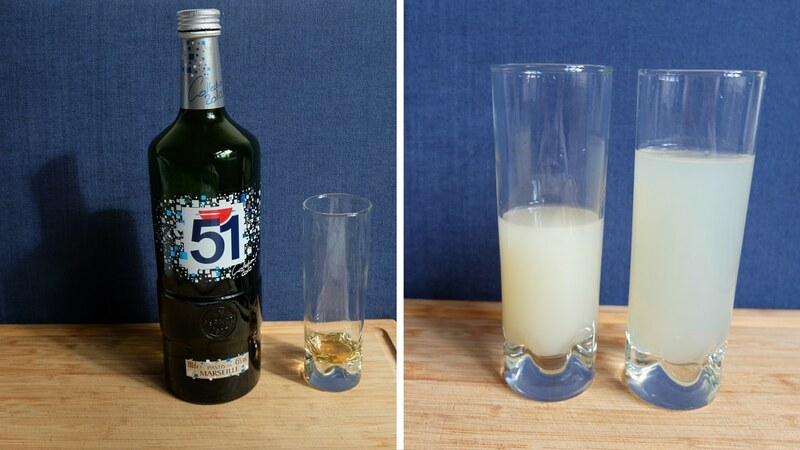 There are two major brands: Ricard (with a more liquorice taste) and Pastis 51. There are dedicated followers to each brand, and they are very faithful: if you criticise their preferred drink in front of them, be prepared to have a solid argument! Besides these two big brands, many artisanal producers create their own spin on the drinks, with each encompassing its own taste. The classic way to drink pastis is to add five to seven parts of very fresh water to one part of pastis in a lengthened or balloon glass. The amount of water depends on your own taste; the more water you add the more refreshing it will be. You can also do the reverse: put fresh water in the glass and add pastis, which for some is a more flavourful option. You can add ice cubes but it is not customary. If you do, do not add the ice cubes before the water: too much cold causes the precipitation of the anethole to crystalalise and neither the flavour nor overall result will be fitting. Pastis can be savoured without water as a ‘little yellow’ (un petit jaune) or a custard (flan). This method is very strong and doesn’t bring forth all the potential flavours of the drink, but it does help sooth bothered stomachs. Pastis becomes opaque when you add water. Stay calm, it’s normal! Anethole (anise essence) is not soluble when there is more water than in the liqueur. It’s one of the cheapest drinks in bars! The French still appreciate this classic and more than 130 million litres are sold every year in France. Two billion glasses of pastis are consumed during the summer! Although aniseed-flavoured drinks existed in the Roman ages, pastis itself is fairly young; it appeared for the first time in 1932 (Ricard, the pastis of Marseille). It came into being after the prohibition of absinthe, also an aniseed-flavoured drink, which with its alcoholic strength of 72 ° (!) drove men crazy. The manufacturing and composition of pastis varied also with the regulation of the regulated maximum alcoholic strength in beverages (30°in 1920, 40° in 1922, 45° in 1938, 16° in 1940, 40° in 1945 and again 45° in 1951). Although unlikely, don’t forget that Pasits is an alcoholic beverage. A normal glass contains as much alcohol as a glass of red wine or a small beer. As with all alcohol, moderation is key to enjoyment. In Pastis all ‘s’s are pronounced. Another term is ‘pastaga’ (pasta+ga like the beginning of Garou) in Marseille. But if you just ask for a pastis at a bar, they will ask you ”Which one? Ricard, 51, Duval…?”. So be prepared…. If your neighbour asks for a tomato, he doesn’t want a tomato juice, but a pastis with a splash of Grenadine syrup. A parrot? with mint syrup. A mauresque? with orgeat syrup, and so on…. Ordering a ‘mummy’ won’t get you to Egypt, but rather just a half shot. One meter of pastis? It consists of aligning small glasses filled with pastis and water on one meter length and then drinking them. It appeared in 1922 when the sale of aniseed-flavoured liqueurs was once again authorised. If someone offers you a pastis from the Landes (pastis landais), your thirst will not be quenched, as this is a cake! And the traditional recipes do not contain any aniseed-flavoured liqueur but rum, vanilla and orange blossom extract. To discover the variety of producers, go to the specialised shop la maison du pastis in Marseille, they offer 75 varieties of pastis and absinthes. Pastis is originally from Marseille, but other regions also produce it, such as Lorraine in the North of France with brands like Pastisbel, Pastis des Lorrains, Aperitis. In Brittany you will enjoy a brand called Kenavo. 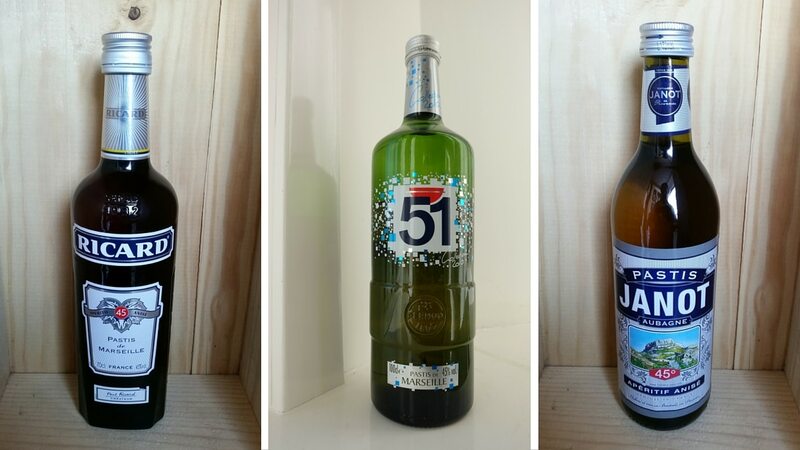 You will find other aniseed-flavoured drinks throughout your trips (Ouzo in Greece, Kummel in the Netherlands, Arak in Liban, Sambuca in Italy) but the taste differs due to the strength of alcohol, the manufacturing processes and additional ingredients. Pastis can add a unique taste to your meals, such as with the ‘melon au pastis’. A lot of fish and seafoods can be cooked with pastis, as well as chicken and eggs. One Response to "How to Drink: Pastis"
They may be served with sugar cubes and a flat perforated pastis (or absinthe) spoon. The idea is to perch the spoon on the lip of the glass and pour the water over the cube to sweeten the drink. A friendly waiter explained this to me at Les Deux Magots, of all places.